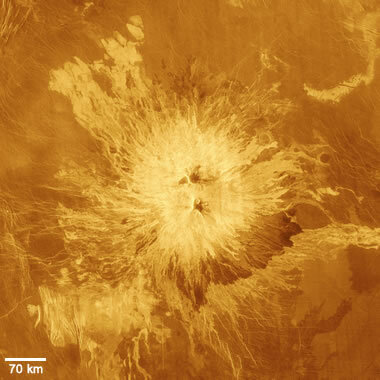 Volcanoes on Venus: A simulated color image of the surface of Venus created by NASA using radar topography data acquired by the Magellan spacecraft. Enlarged views at 900 x 900 pixels or 4000 x 4000 pixels. Venus is the closest planet to Earth. However, the surface of Venus is obscured by several layers of thick cloud cover. These clouds are so thick and so persistent that optical telescope observations from Earth are unable to produce clear images of the planet's surface features. 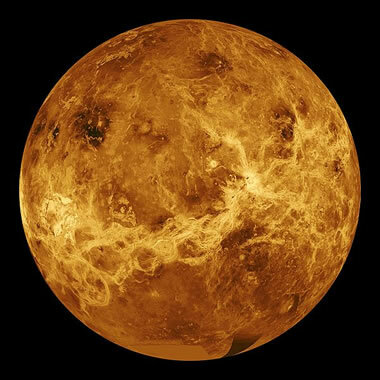 The first detailed information about the surface of Venus was obtained in the early 1990s, when the Magellan spacecraft (also known as the Venus Radar Mapper) used radar imaging to produce detailed topography data for most of the planet's surface. That data was used to create images of Venus such as the ones shown on this page. Researchers expected the topography data to reveal volcanic features on Venus, but they were surprised to learn that at least 90% of the planet's surface was covered by lava flows and broad shield volcanoes. They were also surprised that these volcanic features on Venus were enormous in size when compared to similar features on Earth. The Hawaiian Islands are often used as examples of large shield volcanoes on Earth. These volcanoes are on the order of 120 kilometers wide at the base and about 8 kilometers in height. They would be among the tallest volcanoes on Venus; however, they would not be competitive in width. Large shield volcanoes on Venus are an impressive 700 kilometers wide at the base but are only about 5.5 kilometers in height. In summary, the large shield volcanoes on Venus are several times as wide as those on Earth and they have a much gentler slope. A relative size comparison of volcanoes on the two planets is shown in the accompanying graphic - which has a vertical exaggeration of about 25x. Sapas Mons Volcano: A simulated color image of Sapas Mons volcano, located on the Atla Regio rise near the equator of Venus. The volcano is about 400 kilometers across and about 1.5 kilometers high. The radial appearance of the volcano at this scale is caused by hundreds of overlapping lava flows - some originating from one of the two summit vents but most originating from flank eruptions. Image created by NASA using radar topography data acquired by the Magellan spacecraft. Enlarged views at 900 x 900 pixels or 3000 x 3000 pixels. Sapas Mons Volcano: An oblique view of Sapas Mons volcano, the same volcano shown in the overhead view above. This image views the volcano from the northwest. Features visible in this image can easily be matched to the overhead view above. Lava flows several hundred kilometers in length appear as narrow channels on the flanks of the volcano and spread into broad flows on the plain that surrounds the volcano. Image by NASA. Enlarge image. Lava flows on Venus are thought to be composed of rocks that are similar to the basalts found on Earth. Many of the lava flows on Venus have lengths of several hundred kilometers. The lava's mobility might be enhanced by the planet's average surface temperature of about 470 degrees Celsius. 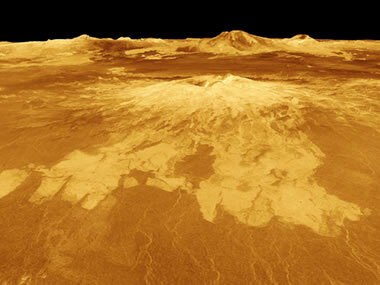 The images of Sapas Mons volcano on this page contain many excellent examples of long lava flows on Venus. The radial appearance of the volcano is produced by long lava flows extending from the two vents at the peak and from numerous flank eruptions. Venus has a large number of features that have been called "pancake domes." These are similar to lava domes found on Earth, but on Venus they are up to 100 times as large. Pancake domes are very broad, with a very flat top and are usually less than 1000 meters in height. They are thought to form by the extrusion of viscous lava. 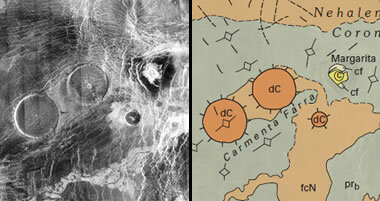 Pancake domes on Venus: Radar image of three pancake domes on the left and a geologic map of the same area on the right. Anyone interested in learning about the surface features of Venus can obtain radar images from NASA and compare them with geologic maps prepared by USGS. Evidence of recent volcanic activity: Radar images of Idunn Mons Volcano in the Imdr Regio region of Venus. The image on the left is a radar topography image with a vertical exaggeration of about 30x. The image on the right is color-enhanced based upon thermal imaging spectrometer data. The red areas are warmer and thought to be evidence of recent lava flows. Image by NASA. When Did the Volcanoes on Venus Form? Most of the surface of Venus is covered by lava flows that have a very low impact cratering density. This low impact density reveals that the planet's surface is mostly less than 500,000,000 years old. Volcanic activity on Venus cannot be detected from Earth, but enhanced radar imaging from the Magellan spacecraft suggests that volcanic activity on Venus still occurs (see accompanying radar image). Geologic map of Venus: USGS has produced detailed geologic maps for many areas of Venus. These maps have descriptions and correlation charts for the mapped units. They also include symbols for faults, lineaments, domes, craters, lava flow directions, ridges, grabens and many other features. These can be paired with NASA radar images to learn about volcanoes and other surface features of Venus. Asteroid impacts have produced many craters on the surface of Venus. Although these features are numerous, they do not cover more than a few percent of the planet's surface. The resurfacing of Venus with lava flows, which is thought to have occurred about 500,000,000 years ago, took place after impact cratering of planets in our solar system had fallen to a very low level. The surface temperature of Venus is about 470 degrees Celsius -- much too high for liquid water. Without water, stream erosion and sedimentation are unable to make significant modifications to the surface of the planet. The only erosional features observed on the planet have been attributed to flowing lava. The atmosphere of Venus is thought to be about 90 times as dense as Earth's. Although this limits wind activity, some dune-shaped features have been identified on Venus. However, the available images do not show wind-modified landscapes covering a significant portion of the planet's surface. Plate tectonic activity on Venus has not been clearly identified. Plate boundaries have not been recognized. Radar images and geologic maps produced for the planet do not show linear volcano chains, spreading ridges, subduction zones, and transform faults that provide evidence of plate tectonics on Earth. NASA Image Gallery of Venus, a searchable collection of images that can be downloaded, NASA, last accessed January 2017. USGS Geologic Maps of Venus, a collection of maps in .pdf format, USGS, last accessed January 2017. Volcano Sapas Mons, images and information about the volcano from the Magellan spacecraft program, NASA, 1996. Venus Global View, computer simulated global view of Venus from the Magellan spacecraft program, NASA, 1996. NASA-Funded Research Suggests Venus is Geologically Alive, article about recent volcanism on Venus, NASA, 2010. Volcanoes on Venus, overview article from the Volcano World collection, Oregon State University, 2005. Volcanic activity is the dominant process for shaping the landscape of Venus, with over 90% of the planet's surface being covered by lava flows and shield volcanoes. The shield volcanoes and lava flows on Venus are very large in size when compared to similar features on Earth.